The Partner Tracking Pixel is designed to facilitate using a third-party shopping cart and still track Partner Program sales. The Pixel is placed on your shopping cart's checkout confirmation page. 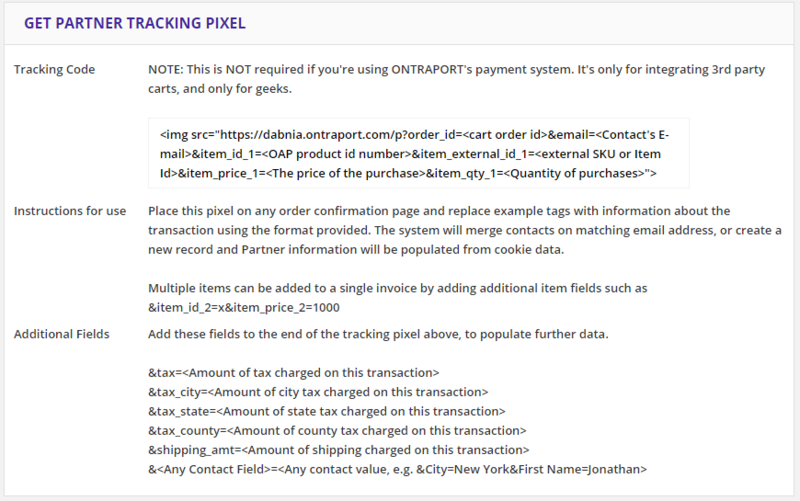 Any purchase made will merge order information into the URL of the Pixel, capturing the information to be tracked in ONTRAPORT. The information includes any Partner Program information passed along when a customer uses a Partner Program link. Configure the pixel as shown in the Get Partner Tracking Pixel dialog to pass the information you want sent back into ONTRAPORT. You can pass information on more than one product by following the instructions in the dialog. Would it be possible to see a example of what the tracking pixel would look like if we wanted to use it to connect to our shopify store?